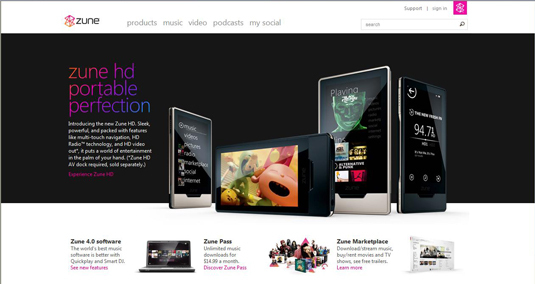 If you prefer your music to change often and you’re not too attached to keeping old music files around, music subscription services like Zune or Rhapsody may better suit you than music stores like iTunes or Amazon. Think of a music subscription service like a version of Netflix for music — as long as you keep the bills paid, you’ll get to keep whatever the service has in its library around. You can always refresh your entire catalog whenever you want to. These services often offer free online listening through their Web sites, so you’re around your music wherever you have a computer and a network connection. Depending on which portable digital media device you own, you can fill that device for a relatively low cost. If you don’t pay the bill, everything goes away. You have to keep your subscription up to keep listening. If you want to download the actual track or burn it to a CD, you’ll probably end up paying extra. The selection of these services can vary wildly. Not all portable devices are compatible with these services (for example, iPod). As opposed to music subscription services, online music stores like iTunes and Amazon operate a bit differently. At online music stores, you actually buy a copy of each song. There’s no monthly fee, you just pay per song, and you can every song as long as you want. Your decision on which kind of service to use depends on how you listen to your music. You may even choose to combine the services, using the subscription services to preview the music and keep you up-to-date on the latest releases and purchasing special tracks from the pay sites (providing your wallet can keep up).